The City of Sydney implemented a Small Parks Upgrade Program which included Elizabeth McCrea Park located in Redfern. We were engaged by the City to prepare a concept design together with detailed design and documentation for the upgrade works. 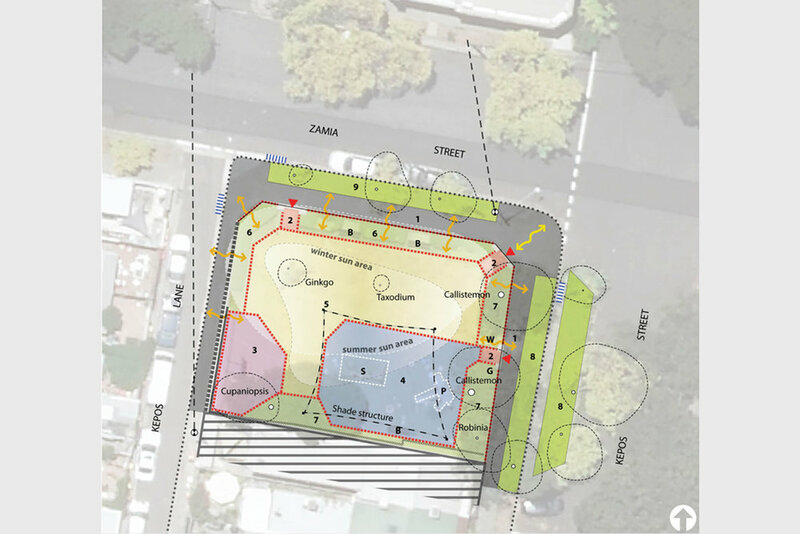 A comprehensive assessment was carried out of existing playgrounds and recreation opportunities within 400m of the Park to identify currently available play opportunities and any gaps that may be filled by new facilities in Elizabeth McCrae Park. Design concept graphics were prepared for presentations to the community by CoS. The new recreation facilities and opportunities incorporated in the Park are a response to initial community consultation carried out by the City. The upgrade works include regrading, drainage, paving, fencing, expansion of an existing shade structure, a new sand pit, playground equipment and nature play opportunities. We prepared a Report on Environmental Factors for the proposed works in collaboration with UrbanAC who provided specialist planning advice. AHMS were also engaged to prepare a Heritage Report that provided a detailed history of the site, which included use for glass and mirror manufacturing. New play opportunities incorporated in the upgrade include a circular sand pit with pre-cast concrete seating wall and associated timber play deck with play panels. Play facilities include a climbing structure with slide, swings, balancing beams, play panels and sandstone blocks to provide a range of opportunities for play and development of physical skills and socialising. The existing shade structure was extended and additional seating provided. Re-cycled bricks are to be used for the pathways and sandstone block will provide a natural play opportunities. Great care was taken to retain and protect existing trees by adopting recommendations of the report prepared by an arborist engaged by the City. The lawn area was rejuvenated and existing sections of hedge retained and incorporated into the new landscape works. Deciduous trees were planted along the northern portion of the Park to provide shade in summer and sun access in winter. Native species of grasses, shrubs and ground cover were incorporated in the landscape design.